Baker Mayfield and Oklahoma took over Ohio State's No. 2 spot with a win over the Buckeyes. Week 3 of the 2017 college football season gave us just a taste of the chaos to come this year. Four ranked matchups Saturday night saw Georgia top Notre Dame, USC finally figure out how to get past Stanford, Clemson survive the battle of the Tigers with Auburn, and Oklahoma get payback at Ohio State. 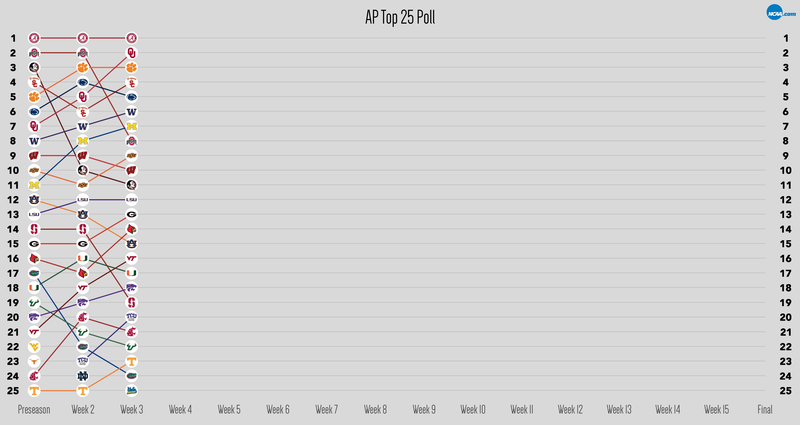 Naturally, the Top 25 was just a bit shaken up after all that. 17-4 — Record for ranked teams in Week 2, winning by an average score of 34-17. The biggest blowout of the week belonged to No. 7 Washington, which beat up on the FCS’ Montana, 63-7. The closest ranked game of the week was No. 15 Georgia’s 20-19 win over No. 24 Notre Dame. Fourteen of the 21 ranked teams that played in Week 3 won by double digits, 12 won by three scores or more, and six (Washington, Kansas State, Oklahoma State, LSU, Tennessee, and Alabama) won by more than 30 points. N.B. : Four ranked teams (No. 10 Florida State, No. 16 Miami, No. 21 South Florida, and No. 22 Florida) did not play their scheduled Week 3 matchups due to the effects of Hurricane Irma. 6 — Number of conferences represented in the Week 2 poll. By weighting the conferences inversely to their teams' rankings (i.e., No. 25 is worth 1, No. 1 is worth 25, etc. ), the Big Ten comes out in first place for the second straight week. While the SEC has the most representatives of any conference (6), two schools in the 20s don’t help its weighted score. The Big Ten has all four of its teams in the Top 10. 3 — Number of teams that didn’t move in the poll. Alabama and Clemson stayed put at No. 1 and No. 3 after the Crimson Tide scored a 41-10 win over Fresno State and the Tigers took down the Tigers (of Auburn, that is) 14-6. At No. 12, LSU stayed stagnant after a 35-point win over Chattanooga. 0 — Number of ranked teams that lost to unranked opponents. Four ranked teams lost last week, but all fell to ranked foes. That leaves then-No. 23 Texas’ loss to unranked Maryland in Week 2 as the sole blemish for the Top 25 this season. 6 — The biggest drop in the rankings this week, courtesy of Ohio State. After holding the No. 2 spot for the first two weeks of the season, the Buckeyes met their match at home against a vengeful Baker Mayfield and No. 5 Oklahoma. A year after Ohio State embarrassed the Sooners at home, Oklahoma got revenge with a 31-16 win, and stole the Buckeyes’ No. 2 spot in the rankings. 3 — The biggest jump in the rankings. Other than Oklahoma, two other teams jumped three spots in the ranking. Lamar Jackson put up 500+ yards and six touchdowns against North Carolina, propelling Louisville from No. 17 to No. 14, and TCU notched a 21-point win over Arkansas, sending them from No. 23 to No. 20. 1 — Number of teams that fell out of the rankings. Notre Dame, which entered the rankings last week for the first time this season, lost a 1-point decision to Georgia at home and walked right back out the ever-rotating door of the Top 25.